Receding gums, more technically know as gingival recession, is a condition in which gum tissue is lost and the roots of the teeth are then exposed. Many people are embarrassed about receding gums and feel that their smiles become too “toothy” and the general look of their mouths become wrong. If you are faced with this condition learn what you can about the causes, symptoms and treatments so that you can make the most informed decisions about how to proceed. Heredity/genes. Up to 30% of the population may be predisposed to receding gums. Exuberant tooth brushing, causing enamel to wear away and gums to recede. Crooked teeth which do not line up correctly and allow gums to recede. Grinding or clenching teeth which forces gums to recede. Periodontal diseases which destroy gum tissue. Inadequate dental care which allows tartar to build up and push on the gums. Hormonal shifts which lead to sensitive gums. Tobacco use which leads to plaque build-up on the teeth. Lip or tongue piercings which can rub on and wear away the gums. Eating disorders which include vomiting and excessive acid in the mouth. Sensitivity to toothpaste ingredients which causes sensitive gums. Movement of the teeth in adulthood. Teeth which become sensitive to heat, cold, sweetness and sour flavours. Noticing that teeth appear longer. Viewing the root of a tooth. Observing or feeling puffiness in the gums. A change or graduated effect to tooth colour. Cavities occurring below the gum line. Wondering if the spaces between teeth have become enlarged. Feeling different textures on the tooth surface. Treating receding gums depends on the causes of the condition. If gingival recession is mild and clearly caused by infection then a good cleaning may be the first step. Antibiotics may be need as well. Gum surgery may be required if cleaning is not enough. 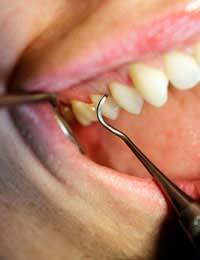 There are three types of surgery used for treating receding gums. Pocket depth surgery means that the gum is folded back, bacteria or build-up is removed and the gum is reattached over the root of the tooth. Regeneration means that the gum is folded back, material is inserted to help regenerate lost bone and tissue and the gum is reattached over the root of the tooth. Finally, a soft tissue graft means that tissue is taken from the gum roof of the mouth and stitched over the gum tissue to encourage regrowth. Receding gums can be embarrassing but there are ways to cope with this condition once you recognise it. Understanding the common causes, symptoms and treatment options will allow you to make the most informed decisions possible about your receding gums.